Hello everyone! I'm going to try a little contest. 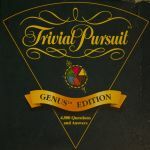 The account that this geeklist is published under is a second account of mine created only for this contest. To win the prize all you have to do is identify who I am. I've been around the Geek for quite some time but generally only use a few of the functions. Every day I will add a new clue to the list and eventually will be spotted by process of elimination. Contestants can make their identity guesses under that day's clue. If the list gets any tips, those will be included in the prize. There is only one prize and it's winner take all. Only one guess per person is allowed each day. When I review them, if nobody has properly identified me, I'll add another clue. If this proves fun I may do it with other geeks as the mystery user. I am older than the first edition of this game (of which I own). Bonus clue: I own at least 50 GG (obviously). I have donated to the geek every year that I've been a member. I am the proud owner of at least one golden meeple. To make things more interesting, the pot will go up by 10GG per day. Current level 62GG. The prize is up to 72GG now. If this list were under my real name it would qualify me for a new geek badge.